Bob Evans Restaurant in Branson takes great pride in serving fresh foods from the farm to your plate. Dining in Branson can be enjoyed best if you dine at Bob Evans which is known for its farm-fresh food that locals and visitors love to taste its great food. Try their fresh cracked eggs, sausage and potatoes, along with other delicious items on their breakfast menu that are served from open to the close of business day. The success of Bob Evans on providing top quality and great hospitality, has helped him built over 500 restaurant locations in the country. If you love farm-fresh food, don’t miss dining in Branson especially at Bob Evans Restaurant. Bob Evans Restaurant serves some of the best breakfasts in town that include Farm Fresh Egg Combinations that are prepared with favorites like its signature, farm-fresh eggs, and buttery biscuits; The Rise & Shine, the most popular breakfast in the restaurant which include two eggs cooked-to-order, your choice of famous breakfast meats, a farmhouse side and freshly baked bread; and Farm-Fresh Egg Breakfast which includes one egg cooked-to-order, and your choice of Bob Evans Sausage or bacon and two biscuits. Other breakfasts with delicious taste in this restaurant also include Farmer’s Choice Breakfast which includes one fruit crepe, three hotcakes or two slices of French toast, it is served with two eggs cooked-to-order, a farmhouse side and one of the restaurant’s famous breakfast meats; Classic Breakfast which includes two hotcakes, a side of French toast or two biscuits, it is served with two eggs cooked-to-order and a choice of one of their famous breakfast meats; and The Mini Sampler with one egg cooked-to-order, your choice of one of famous breakfast meats, a farmhouse side and freshly baked bread. The restaurant also offers value breakfasts that include Farm-Fresh Egg Breakfast, Brioche French Toast, Hotcakes, Multi-grain Hotcakes, Country Biscuit Breakfast, and Griddle Combo. Bob Evans Restaurant also offers delicious omelets which include Bacon Lover’s Omelet, Border Scramble Omelet, Western Omelet, Veggie Omelet, and Build Your Own Omelet. These omelets are served with new hash browns or home fries and two freshly baked buttermilk biscuits. If you prefer to eat farm-fresh food, don’t miss that delicious meal of fresh food at Bob Evans. The food here is just as good as wonderful as always. This great dining place in Branson really offers great home cooked meals, with lots of seating, friendly servers and reasonable prices. If you are looking for delicious chicken pot pies, and tasty homemade biscuits, this is the place to go. Much of the portions served here are more than enough to make your belly happy. With the quality of food served in this restaurant and its excellent service, you are sure to come back the next time you visit Branson. 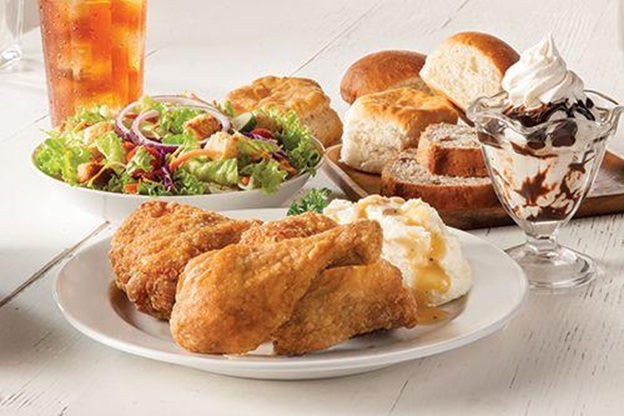 So, if you want to enjoy dining in Branson at its best, don’t miss to visit Bob Evans Restaurant where you will enjoy the delicious taste of fresh foods from the farm to your plate.